It came to me in meditation this morning that my adrenals have been stressed since I was a kid. I had an incident of abandonment when I was four years old. I was rushed to hospital with kidney malfunction and kept there for 2 months. My mother was allowed to visit for an hour a week and my father didn’t come at all because that hour was at work time. And, of course, there was no explanation given at all for any of this. I thought they’d given me away because a new baby had arrived recently. The hospital was run like an army boot camp, the nurses were not allowed to touch me or play with me as I got better and it was like being in jail. I’ve known for ages that experience was the root of much of my odd way of looking at the world and I’ve done all kinds of therapy on it. But this morning I saw clearly that if anyone had known anything about adrenals back then it could have changed my life. So I had a chat with my adrenals this morning and promised to treat them better and I thought some of you might like to do the same. 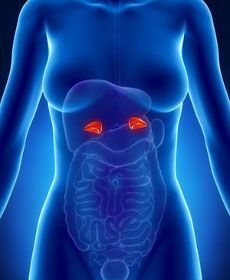 Our adrenals are the two glands that sit on top of our kidneys. They secrete all kinds of hormones that we need to stay balanced, the most important being cortisol. When we are in a stressful situation our adrenals pump out cortisol, the fight or flight hormone, and it gives us a jolt of power. In the usual example of a bear coming closer, we would have the sudden energy to climb a tree, run like heck or pick up a big branch and whack him with it. So, nowadays, our lives are stressed all the time from the crazy way we live in this culture; traffic, jobs, relationships, finances, responsibilities we wish we didn’t have but can’t get out of, etc. etc. So instead of running to a safe place and settling back into peace, we are always on minor red alert. This destroys the adrenals. I don’t know many women whose adrenals are in great shape actually. I think adrenal malfunction is one of the first things to set you on the downhill spiral. The thyroid generally goes next, and so on and on, until you become someone you wouldn’t have recognized a few years ago. I have known for ages what makes my adrenals happy, but haven’t always been able to give them the priority they deserve. So when they are unhappy, I get crabby, when I’m crabby, more bad stuff happens because of my negative energy field. Then I’m even less likely to settle down into a peaceful state that would make them feel happier. Now my new mantra is – When my adrenals are happy, I’m happy! I am more the joyful, caring person I came into this body to be. So we had a chat this morning. I’m really coming to believe that our bodies are like a village, every part of it has it’s own patterns and it’s own agenda and we all have to get along. I apologized from my deepest heart for the abuse I’ve heaped on my adrenals all these years. I sent them huge love and appreciation for allowing me to awaken as much as I have. I told them that now I have a deep connection with Source, (God) my feeling of being alone in the world has dissipated most of the time. And I promised to keep them in my awareness when stuff comes up and deal with it in a way that doesn’t stress them out too much. For instance, if I get mad at something during my day I just release it to Source and bless the person who annoyed me. The adrenals loved that!! So I realize that to some of you I sound like a complete nut case. But I think that our adrenal health is very connected with our bones and we can do all the right things to improve our bone density but if our adrenals are on red alert all day our whole body suffers and stops growing and starts concentrating on just maintaining the vital organs. Bones are not vital organs to the body so they get put on the back burner. Adrenal health is also directly connected with sleep – and if we don’t sleep well everything in the body and mind goes downhill. I won’t bore you with all the things happy adrenals will do for you. I’m sure most of you know all that already. So my main contribution here is to let you know that you can talk to your body parts (your village) and appreciate them and give them love instead of blaming them for your sad or fearful or mad day or even life.